A maximum/minimum registering thermometer records the highest and lowest temperatures seen by the thermometer between settings. A ‘u’ shaped tube holds a clear liquid and columns of mercury. As the temperature increases, the liquid in the temperature sensing bulb expands forcing the mercury up the maximum scale. When the temperature falls, the liquid contracts and the mercury follows it back up the minimum scale. Small glass and wire floats called limit markers are pushed to the temperature limits by the two sides of the mercury column. The markers are held in position by a magnet in the back of the case and the maximum/minimum temperature are read at the bottom point of the markers. The current or immediate temperature can always be read at the top of the mercury column as in a single tube thermometer. It is important to note that the minimum scale is inverted with the lower temperatures above the higher. 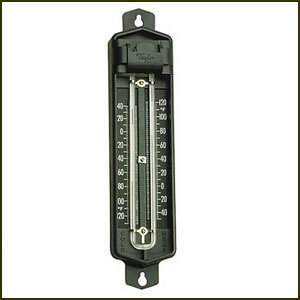 Until you become accustomed to reading this “upside down” scale, some care may be required to get accurate readings.